For some inexplicable reason, we just can't get enough of watching how things are made. Recently, we've been captivated by another video that's captured the true mesmerizing beauty (?) 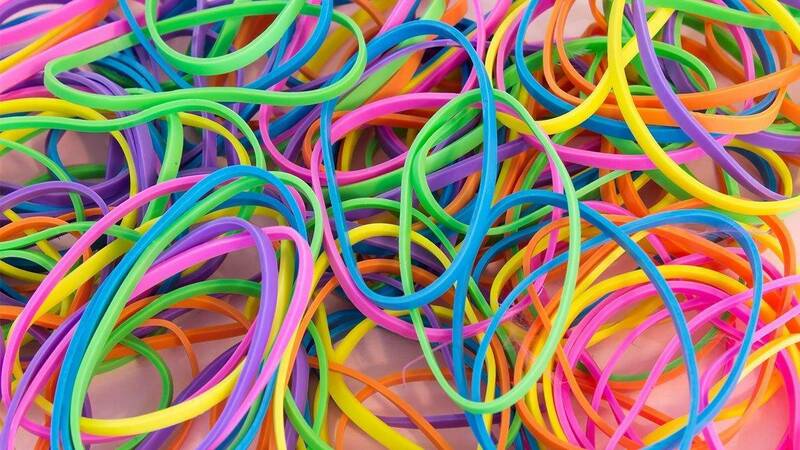 of how something's made, and this time it's... rubber bands. Yeah, fine, it sounds potentially very dull. But before you judge, just watch. It seems utterly mad that creating a teeny rubber band that will probably just end up in the bin/your desk drawer indefinitely takes so long to make. And the process is pretty damn complicated. Here's a little bit of info we've learned about the humble rubber band recently. It was invented in the UK in the 18th century. Our beloved bands start of life as blocks of spongey-type material that's basically just sap from rubber trees. For some reason, they dye it yellow, too. After the rubber has been formed into a "dough" (Spoiler: It does not look delicious), there are loads of other bizarre processes it has to go through before it evolves into a band. There's a whole thing with a giant rolling pin which almost put me into a trance. But the best bit is seeing it all swirled up like a pastry cheese twist because it's just incredibly satisfying. I won't attempt to explain the whole process because hey, I'm not a rubber band scientist. I just couldn't do it justice.